'All About Presentations' by Jazz Factory: What is RSS Feed? If you want to read a blog or a website regularly then RSS is a very useful tool for you. I will explain in brief what it means and how it works. If you know what RSS means and are already using it, you can skip this post. There are many ways you can read a blog or a news website. 1) You can visit it daily or weekly using your browser (Internet Explorer, Chrome or Mozilla). 2) You can subscribe to updates by email. So everytime I write a new post, it comes automatically to your inbox. 3) You can subscribe to RSS Feeds and read the posts on your computer. Everytime I write a post, your RSS reader will automatically download and store it for you. It will be marked as unread and you can read it at your own sweet time. The main benefit of using RSS is the ease of following all the blogs/sites you want to read at one place. You first need a Feed Reader. This is an application which aggregates feeds from all the websites/blogs you want to subscribe to. There are both online and offline Feed Readers. Google Reader, Bloglines are some of the popular online Feed Readers. Feed Demon, Omea Reader and MS Outlook 2007 are offline Feed Readers. I am using Omea Reader. If you want to be able to download feeds (posts which I write on the blog) and store on your computer so you can read offline then you need an offline Feed Reader. This is similar to how we read emails on Outlook. When you connect to net it downloads your emails and then lets you read it even when you go offline. In case of online Feed Readers, to read your feeds you need to log in (the way you log in for your gmail) and start reading on your browser. First decide on which type of Feed Reader you want. For online Feed Readers, just visit their site, create a log in and start subscribing. For offline Feed Readers, download the application and install it on your computer. Then subscribe to the feeds. Suppose you have installed Omea Reader and you want to subscribe to my blog . 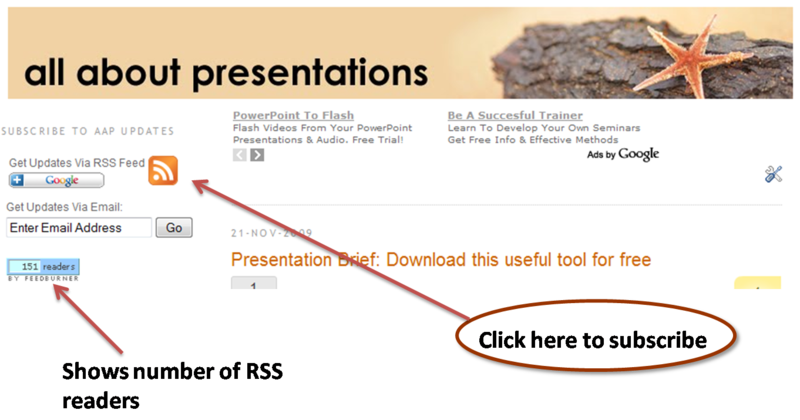 Click on the RSS icon on the blog (as shown in the image above) and proceed with the subscription. Else, you can go to Omea Reader and click 'Subscribe to New Feed'. Then type the link (http://feeds2.feedburner.com/AllAboutPresentations) which is shown when you keep you mouse over the RSS icon. Alternatively, you can just type the blog URL (www.allaboutpresentations.com) and it will automatically detect the feed. Read more on RSS here. See you on Feed Reader soon!